TWO Britons have been given public floggings in Saudi Arabia for breaking the Moslem law which forbids alcohol. One report says the two men, Nigel Maidment and Brian Cooper - both engineers working on Saudi Arabian contracts - may have received as many as 70 strokes of the cane each. Seven other Britons are facing floggings of between 30 and 60 strokes, also for breaking the laws on alcohol. Apparently they asked for this punishment rather than face an extended spell in prison. They were sentenced to six months' jail as well as the flogging and are expected home soon. Mr Maidment, 27, from Mere, Wiltshire, and Mr Cooper, 35, from Colchester, Essex, went to Ha'il to work on the extension of the local airport being undertaken by Faircloughs of Cheshire. They were employed by Prismo, a British sub-contractor - at about 800 a month tax free - to operate large motorised marking machines, putting white lines on the runway. Their employers gave them the customary warning for Britons going to strict Moslem countries about the local prohibition of alcohol. But there is often a diplomatic blind eye turned to its consumption in private. Mr Maidment and Mr Cooper endured their punishment last month in a square at Ha'il, a caravan crossroads town 250 miles north of Medina. They were arrested in December and accused of manufacturing and distributing alcohol. Their humiliating ordeal has brought angry diplomatic protests to Saudi Arabia from Britain and threatens to cause trouble in the Commons for the Government. Although the floggings were not as savage as those carried out in Pakistan recently, they left Mr Maidment and Mr Cooper severely bruised. Normally, a prison official administers the punishment with a copy of the Koran - the Moslem Bible - tucked under his right arm, thus restricting the length of his swing with the cane. The two men were visited three days ago by the British Vice-Consul from Jeddah, Mr Alexander Howard, who found them fit and well. But they forbade the Foreign Office in London to disclose their names or inform their relatives that they had been flogged. The Foreign Secretary, Dr Owen, is incensed at the severity of the sentence in this case. He has personally instructed the Ambassador, Mr John Wilton, to make strong representations to the Saudi authorities. While recognising the provisions of Koranic law, the Foreign Office assumed that they would not be rigorously applied to Europeans. It was thought that expulsion after a short prison sentence would be an adequate deterrent. Discussions were taking place in Jeddah on this point and seemed to be reaching an understanding. Then, without warning, the provincial governor at Ha'il ordered the floggings of Mr Maidment and Mr Cooper to take place. They were carried out on May 15. An executive of the men's firm said he understood the Saudis had taken a particularly strong line because of allegations that Mr Maidment and Mr Cooper had made alcohol available to Yemeni workers on the airport site. Another factor was that Europeans are new to Ha'il and the local governor was not prepared to exercise the tolerance that might be shown in the bigger cities. Vigorous action is now being mounted by the Foreign Office in an attempt to ensure that the other seven floggings -- the results of sentences separate from the Ha'il trial -- are not carried out. Recently another Briton, Colin Mallalieu, a 30-year-old fork-lift truck salesman, who studied at Manchester University, was reprieved from a public flogging sentence of 100 strokes. Dr Owen's defence to critics in the Commons will be based on the fact that there is a limit to the amount of pressure Britain can exert on any Arab country over Koranic law without facing trouble. And when men under sentence of flogging decide to get it over and get out of the country any Foreign Secretary has to be chary of making them wait in jail while the diplomatic shuttlecocks go back and forth. The row that is sure to follow the Maidment-Cooper case will put a severe strain on Britain's relations with Saudi Arabia, our second-biggest Arab trading partner which supplies 20 p.c. of our oil. TWO Britons who were flogged in an Arab market place for making illicit hooch came home yesterday ... to a pint of best bitter. Brian Cooper and Nigel Maidment drank to freedom soon after being reunited with their wives at a Buckinghamshire hotel. They had suffered 70 strokes of the cane and six months' imprisonment in Saudi Arabia for running an illicit still. Both 35-year-old Cooper and Maidment, 28, admitted yesterday that they knew they were breaking Saudi law by manufacturing their hell-fire brew. But, they said, they had no idea of the severity of the penalties imposed by the Koran. Anyway, they claimed they were not the only offenders. Many Europeans were making illicit alcohol. On the day of the flogging, hundreds of Arabs stood and stared in the market place as the two Britons were thrashed by a Saudi policeman using a 4ft. 6in. bamboo cane. Cooper told how they tried to blank out their minds as blow after blow flailed down on their backs and buttocks. He said: "We stood with our fists clenched, thinking: "You can cut me in half mister, I won't scream out." 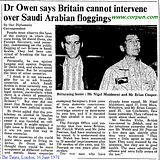 People must observe the laws of the country in which they were living, Dr David Owen, the Foreign Secretary, said yesterday, commenting on the public flogging of two Britons in Saudi Arabia. They had been convicted of breaking the ban on alcohol. 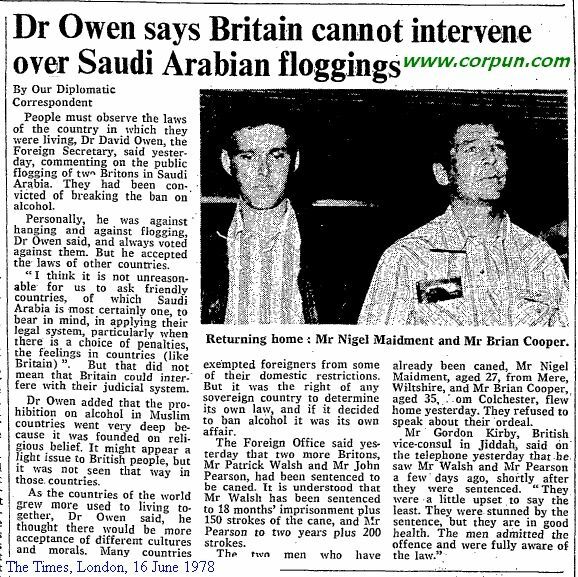 Personally, he was against hanging and against flogging, Dr Owen said, and always voted against them. But he accepted the laws of other countries. "I think it is not unreasonable for us to ask friendly countries, of which Saudi Arabia is most certainly one, to bear in mind, in applying their legal system, particularly when there is a choice of penalties, the feelings in countries (like Britain)". But that did not mean that Britain could interfere with their judicial system. Dr Owen added that the prohibition on alcohol in Muslim countries went very deep because it was founded on religious belief. It might appear a light issue to British people, but it was not seen that way in those countries. As the countries of the world grew more used to living together, Dr Owen said, he thought there would be more acceptance of different cultures and morals. Many countries exempted foreigners from some of their domestic restrictions. But it was the right of any sovereign country to determine its own law, and if it decided to ban alcohol it was its own affair. The Foreign Office said yesterday that two more Britons, Mr Patrick Walsh and Mr John Pearson, had been sentenced to be caned. It is understood that Mr Walsh has been sentenced to 18 months' imprisonment plus 150 strokes of the cane, and Mr Pearson to two years plus 200 strokes. The two men who have already been caned, Mr Nigel Maidment, aged 27, from Mere, Wiltshire, and Mr Brian Cooper, aged 35, from Colchester, flew home yesterday. They refused to speak about their ordeal. Mr Gordon Kirby, British vice-consul in Jiddah, said on the telephone yesterday that he saw Mr Walsh and Mr Pearson a few days ago, shortly after they were sentenced. "They were a little upset to say the least. They were stunned by the sentence, but they are in good health. The men admitted the offence and were fully aware of the law."